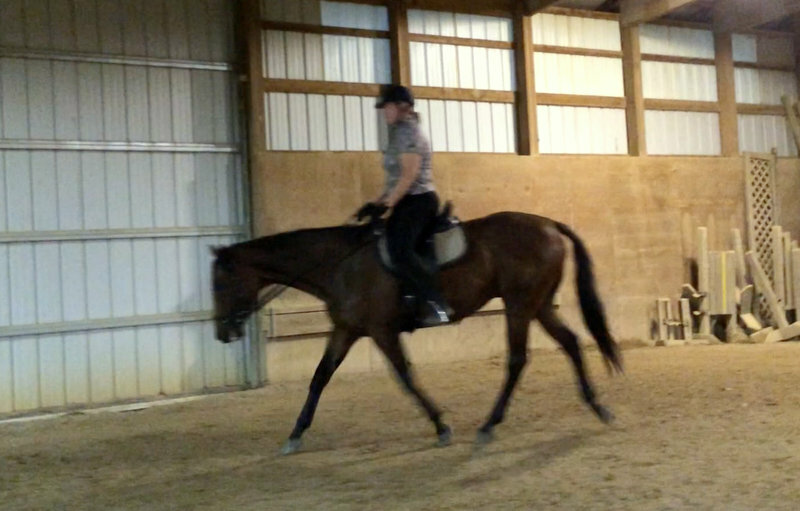 I didn’t think it would happen this quickly, but just a couple weeks after I said goodbye to Derby, I have a new horse. 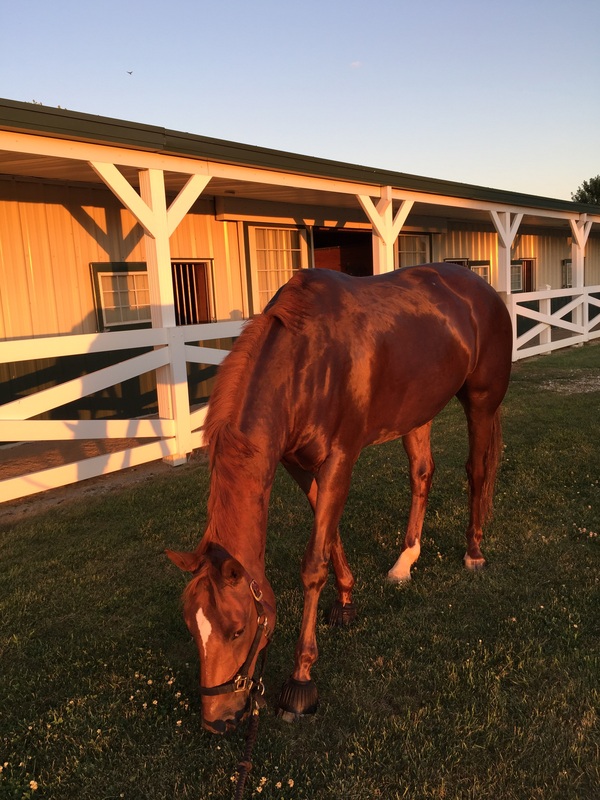 My heart really wasn’t in it, but I started to make my long and exhaustive list of things I wanted in my next equine partner the weekend I said farewell to Derbs. Christy has her students go through this process, and it really does help. It’s not unlike buying a house. It helps to put parameters around what you’re looking for and avoid getting distracted by things you really shouldn’t buy. If you wanted a four bedroom house, for example, there’s no sense in looking at a two bedroom condo. No matter how fancy the neighborhood or how great the view, if you need four bedrooms, that two bedroom condo is not going to work long term. 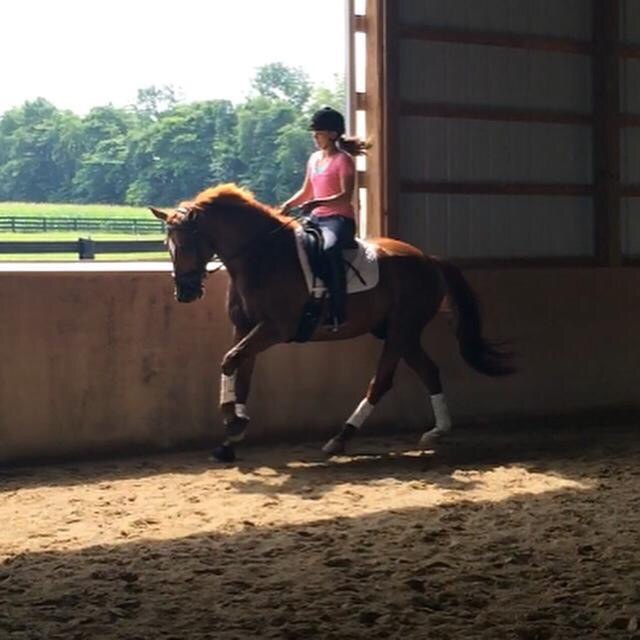 Enjoy my horse, learn and develop as a rider, have fun, and be able to go show, go to clinics and ride out on trails with confidence. Easygoing temperament. More whoa than Go! TB cross, but not Anglo Arab. Hybrid vigor is important to me. Do not want a pureblood anything. 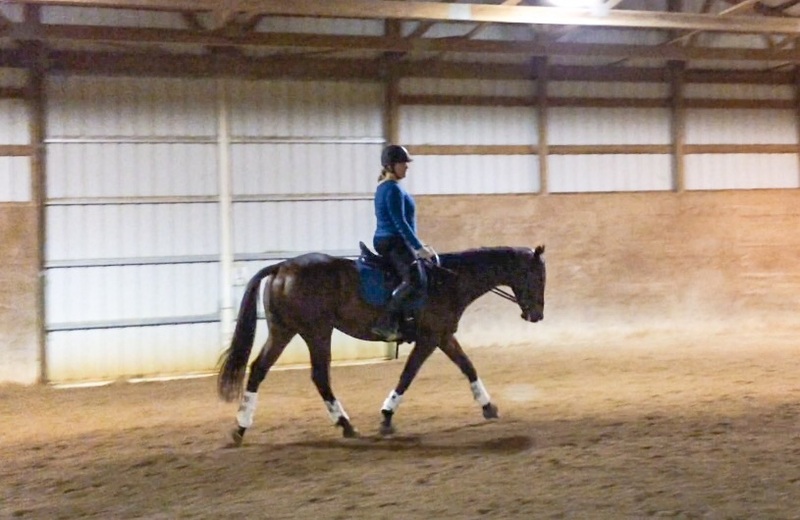 Three correct gaits, but not enormous gaits. Rideability is key. No color preference but God, please, not a Paint with lots of white and blue eyes and whatnot because that is NOT how I roll. And not a ton of hair either, though I suppose that is why God made clippers. One of the eye catching pictures from Fred’s ad. looked hot in the video found his way onto the list. 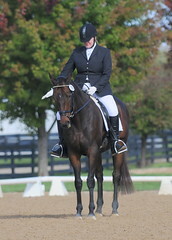 A green Friesian cross followed in short order. Talk about the universe sending a message. I did not want to be that person. I have seen those women, overhorsed past the point of danger. A couple were severely injured. Non were having fun. I came to my senses and immediately deleted all the fancy youngsters from my list. Happily, Christy was faring better. 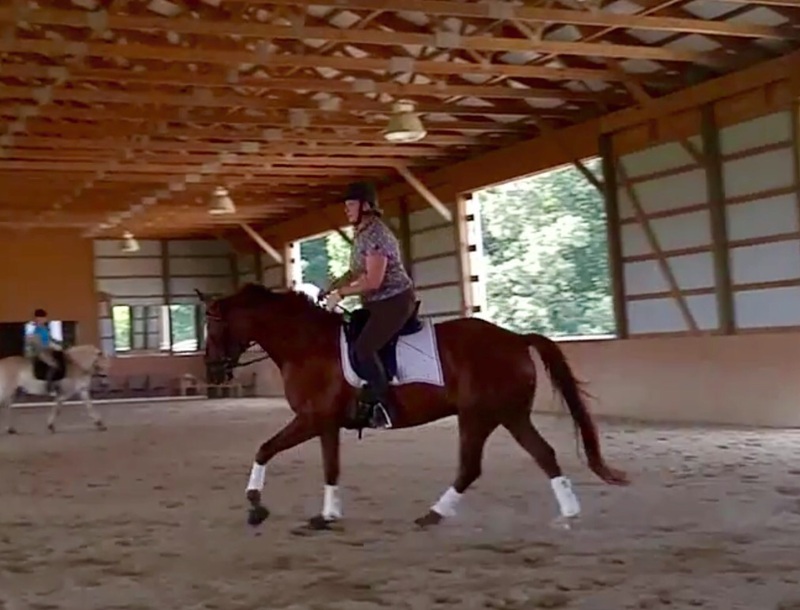 She spotted an ad for a horse that sounded perfect in a dressage group on Facebook, and tagged me. During the test ride. I felt comfortable right away. 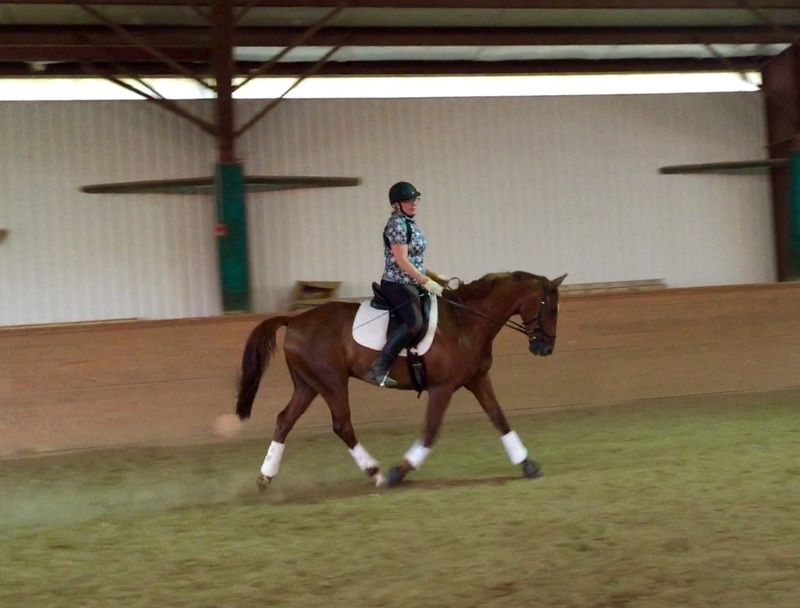 And this canter is really nice. I looked at that ad, and looked again. The pictures looked great and the description sounded spot on. The horse was a hair over budget, and 300 miles away, in Ohio, but if he was for sale in the Chicago area, he’d be out of my range. I contacted the seller. 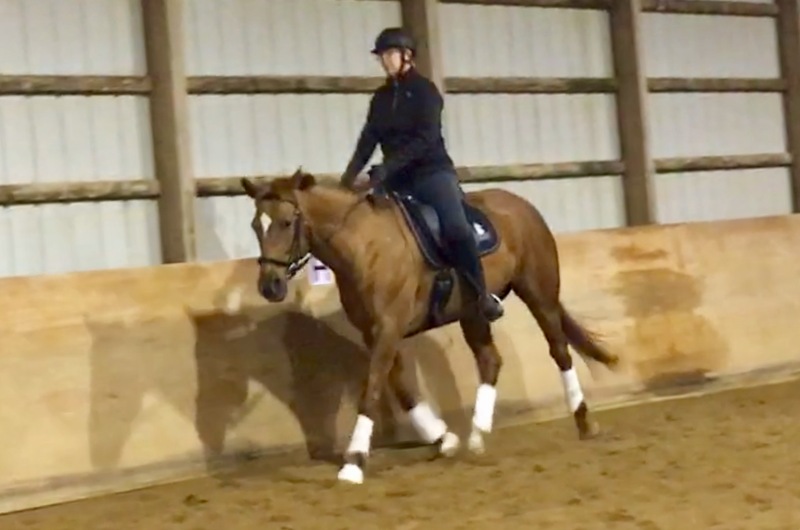 After a couple email exchanges and a phone call, the horse, a 9 year old 3/4 TB 1/4 Belgian named Remington, was sounding better and better. He had been started slowly by his breeder, raised with a menagerie and hacked all around a 100 acre property. 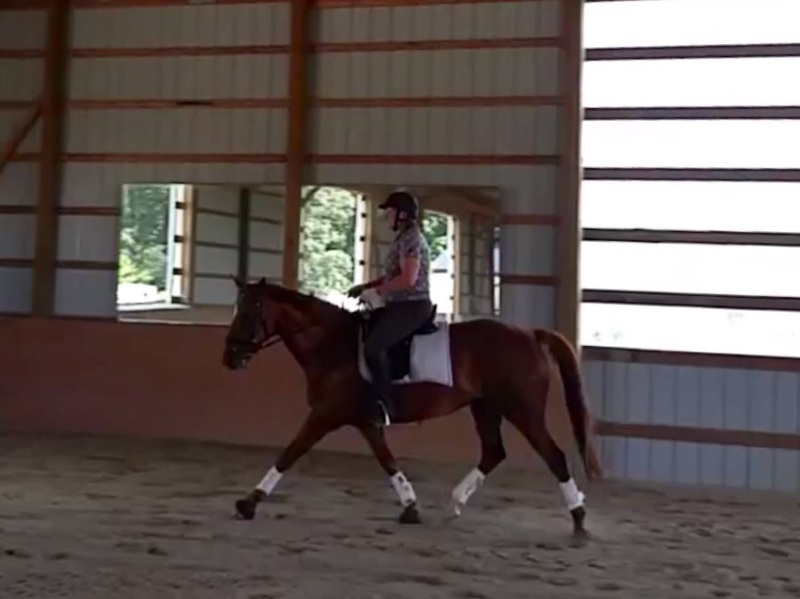 He’d been out to some hunter schooling shows and had also schooled some XC, and had been a star. 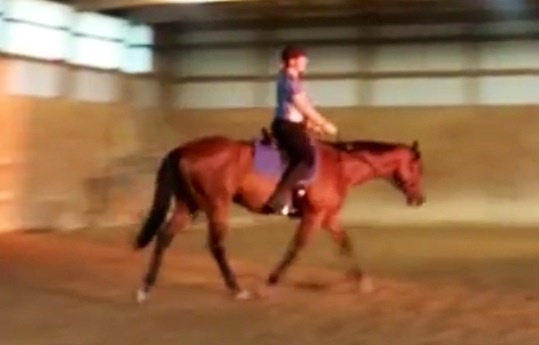 He was now schooling First/Second. He was a chill dude and tended to be lazy. He was chestnut with a star and a little sock. Pretty much every box on my list was checked. Another snippet from the test ride. Fancy. Christy and I made the trip to see Remington the following weekend. I was the first to ride, defying convention a bit, but I wanted to see what he was like, and he was fine. 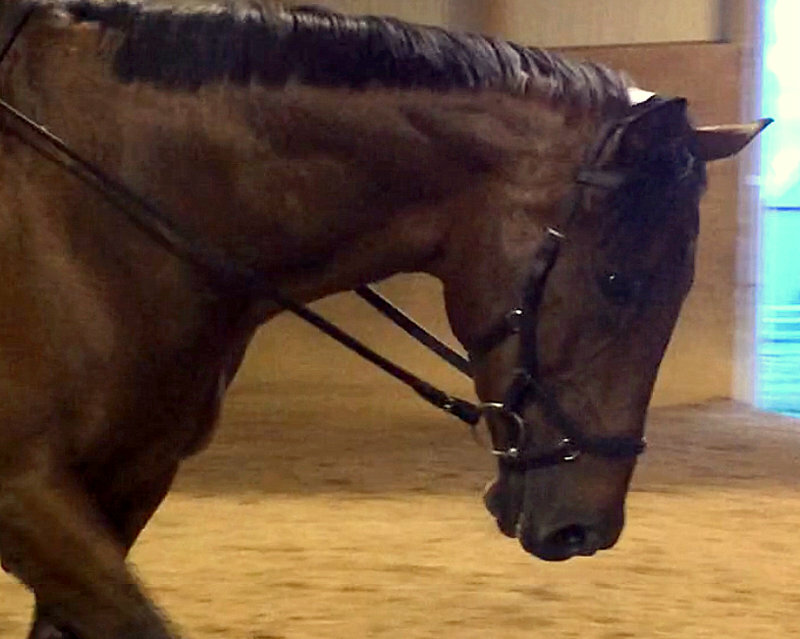 I really enjoyed the ride, and felt like we clicked pretty quickly, which I can’t say for evey horse I get on. I even earned some compliments from the peanut gler watching us. Christy hopped on, pushed some puttons, and agreed that he’d be a good fit for me. 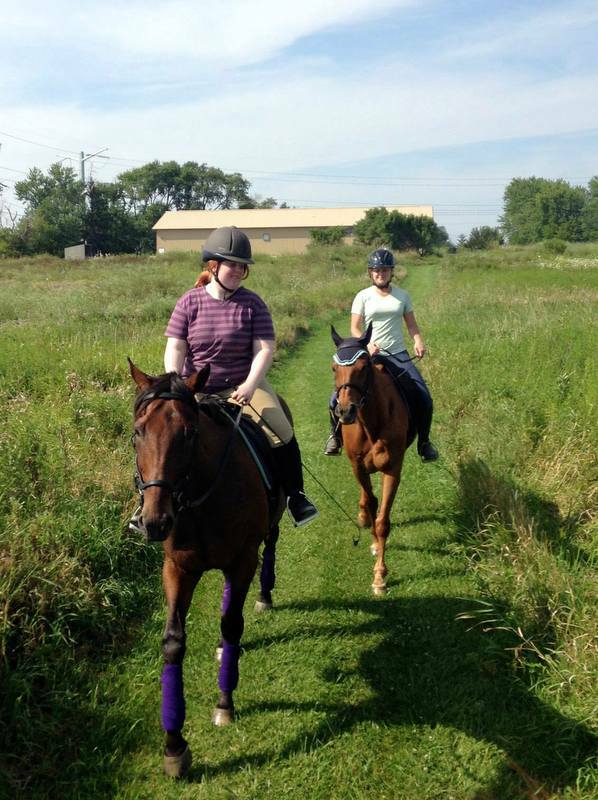 I got back on, and finished up with a short hack out around the property – across a meadow, into the woods – on a loose rein and easy peasy. Four of Remington’s full siblings were also at the barn, and I got to see two working, and they were very nice. The various owners are really happy with them. I made the decision to have him vetted. 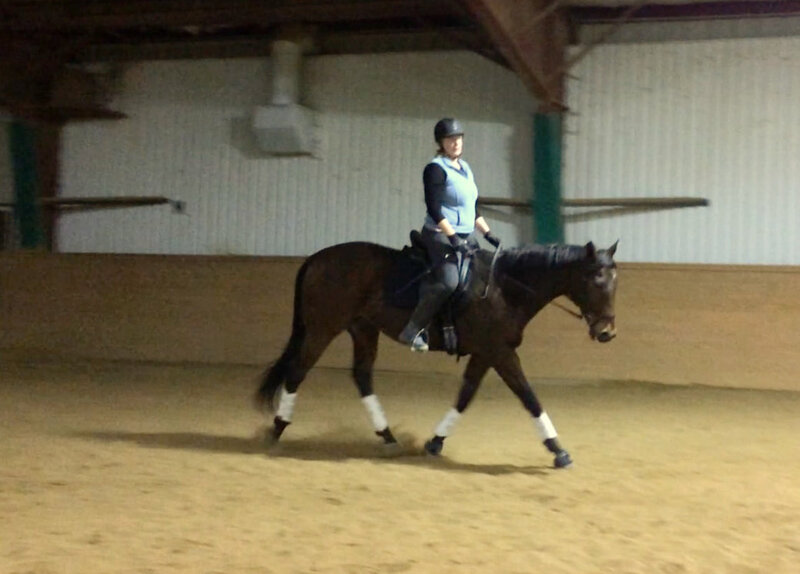 From our lesson last night. He passed with flying colors, and arrived last Friday night. He was a good boy upon arrival – a little wound up but well behaved and polite. He subutted to the indignities of having his temperature taken, and then being dosed with gastrogard and electrolyte paste with good grace. Our first ride on Saturday was uneventful. Freddie, as I am calling him, a nod to the artist Frederic Remington, got a walk around the property and then a tour of the indoor before I mounted up for our first ride. 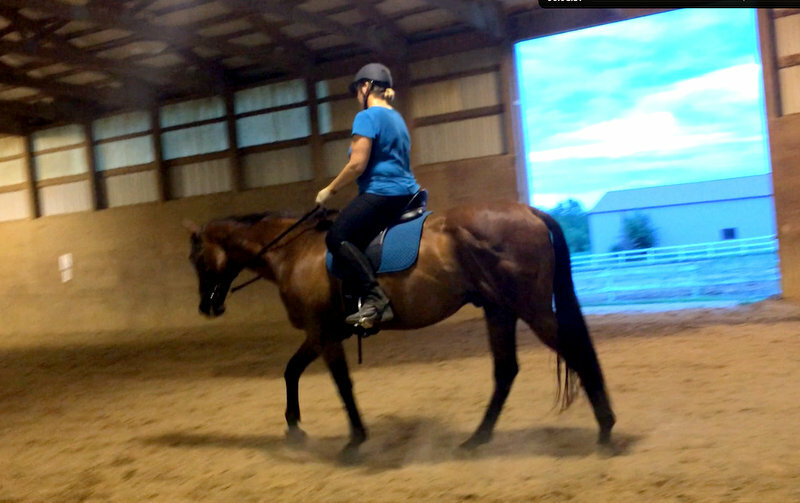 In the indoor, alone, he was calling for the others, who were in a bit of a uproar due to the arrival of a new mare who had all the girls in a tizzy. I turned him loose for a minute, and marveled at the the dampening effect of the Belgian blood on the TB fire. There were no death-defying vertical bucks or eye-popping bursts of speed. It made me appreciate the athleticism of the TB, and also it affirmed my decision to buy Freddie. Everything I saw looked very, very rideable. – Responsiveness, especially the forward response. – Riding him out and into contact – he is a horse that will curl on you. – Fitness overall, and suppless on this right side in particular. 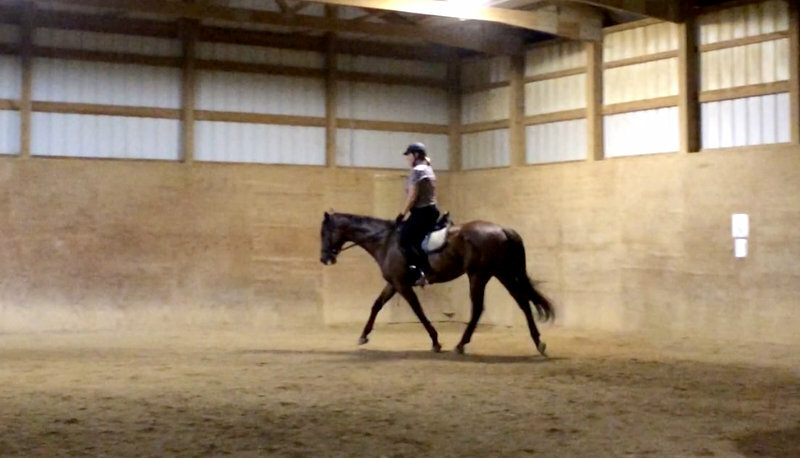 But over all, I am so pleased with this horse. He is also very personable and social. 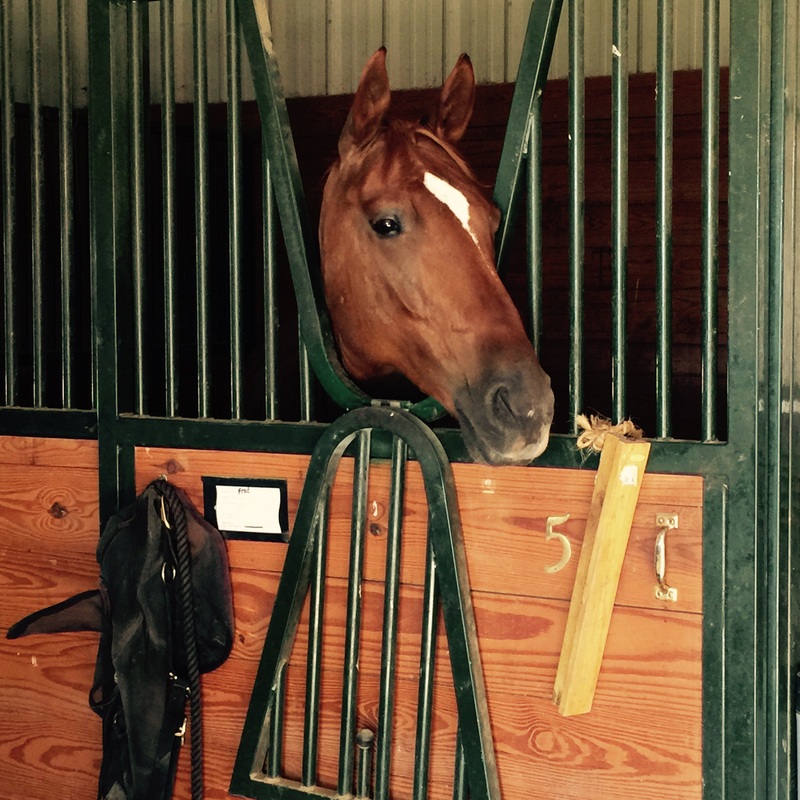 He marched right over to me on Saturday when I went up to the gate of his pasture and called his new name, and he hangs his head out of his stall, watching as I putter around, cleaning our tack and tidying up. He’s never been anybody’s number one, and I think he’s going to love being the center of attention.